Saturday June 3, 2017, brings the chance to look around some impressive modern homes, all in the name of architecture. The MA + DS home tours are designed to inspire people to think: what kind of home could they have if they had the money to hire an architect? Some actually have the money and are ready to build. Others are just dreaming. Ken Shallcross, a vice president at MA + DS (who lives in a 1930s Tudor in the Bronx) said the tour differs from that by Dwell magazine in that it potentially appeals to a wider audience. "Dwell goes for anything new and impressive, to cater to their readers, not the general public. We try to let people who might have nothing to do with design know about the chance to see cool houses." Shallcross treats the tours like an open day at a museum or gallery, where the public gets to meet the artists. Because the architects don't get their names on houses like they do on public and commercial buildings, this is their chance to show off. He expects 500 to 700 people to take the tour this year. "I start a 2018 folder for every tour, putting in the places that couldn't make it this year or which aren't built yet." "Every year, the folders for Seattle, Portland and Houston are always full. In the Pacific Northwest especially there are always new homes being built and people wanting to show them off." Brian Libby, architecture columnist, dates Mid-century Modern from 1954, whereas Modernism is more from the 1920s to the 1960s. These are often the low-slung ranch homes that lacked ornament and embodies post-War optimism. "The term 'Contemporary' denotes houses of a more recent vintage. I can't quite tell you when Modernism hands the baton to Contemporary. People sometimes use Modern to mean a house that was recently constructed." Libby points out that in suburbia you can find homes that are a mish-mash of Contemporary and traditional styles. "What you often see is someone taking the traditional notion of a home, taking it apart and putting it back together in different ways. A lot of housing mixes traditional and contemporary, and it can be done well." 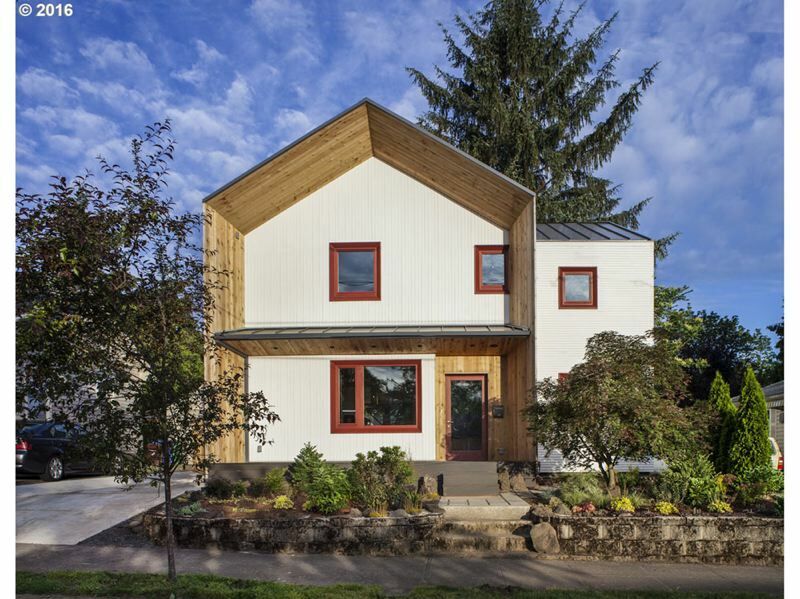 For example, Home number Five on the tour in North Portland was designed by Scott Pitek. The single-family residence has a traditional pitched roof and strikingly regular square windows. It was developed to maximize the livability, density and value of an underutilized corner urban lot. The design is described as "simple and cost conscious, yet flexibly adapts to its resident's needs and integrates with its context." The owner saved money by acting as the general contractor. The original cottage became the ADU. It has energy saving features such as R-30 walls, exterior rain screen siding and hydronic floor/wall and hot water heating from a central natural-gas boiler system. One thing that Libby and the organizers look for is homes with a lot of glass and natural light, and wide open spaces, particularly in the kitchen and living room. "A lot of traditional houses are contemporary in the inside, in that respect," says Libby. "These days nobody says 'I think we should have more walls.'" For the exterior, however, the American dream of the house with the pitched roof, shutters and white picket fence lives on. "It's evocative of some ideal of America that doesn't exist any more." Libby reminds us that "most houses are not one style or the other. Less than 10 percent of single family homes in the U.S. are designed by an architect." Most are designed by builders from plans bought from a style book. "There are a lot of Frankenstein houses. They may from one angle look contemporary and from another look like someone cooking from a lot of ingredients who is not a chef." And in Portland there is always the issue of infill — the lack of space driving the need to build upwards. "Real Mid-century modern homes are about horizontality," he adds. "A contemporary house is more likely to have double height ceilings." 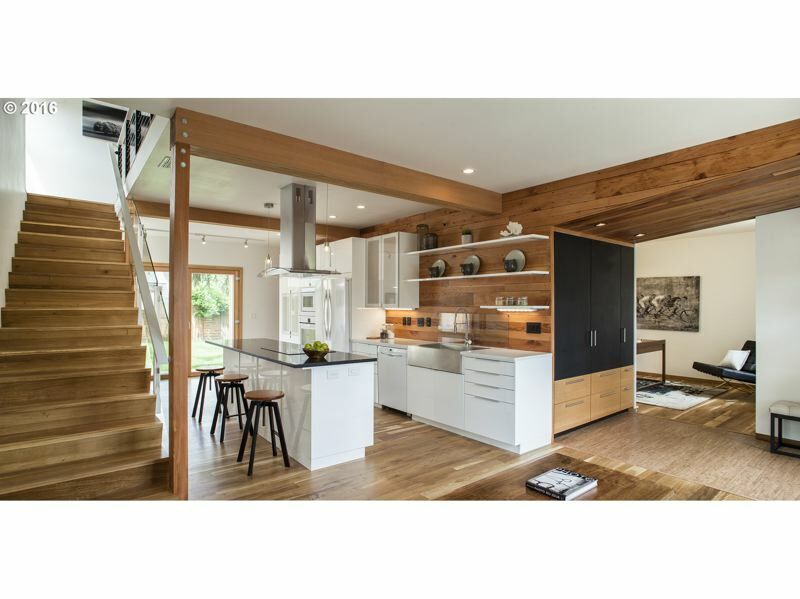 The goal of this tour was to have a variety of older Mid-century Modern, more contemporary homes, geographical variety (from Portland to the suburbs) and at least one home that demonstrated leading sustainability thinking. Libby says that with the clean, sometimes austere lines of Modernism can come a hint of glamor. The Camas house is well worth the extra mileage to visit. With its parapet walls and façade design, the 4,200 square foot Tishenko residence presents an aggressive series of rectangles on a grade. But inside it is softer and welcoming, sort of Clockwork Orange by Martha Stewart. There is a circular pit in the living room and an egg-shaped stove suspended from the ceiling like a giant golf tee. There are tall windows with six figure views and wood vies with bright white for the dominant look. "What constitutes luxury or contemporary style is always evolving," says Libby. "Now we see some whimsy or sassiness — people want that Instagram moment." He says you can see it more often in the flamboyance of hospitality design, for example where the restraint and lack of ornament of Modernism gives way and a room is dominated by a giant chandelier. "Today, there's a Maximalism that is the opposite of restraint." Libby also appreciates Mid-century modern because it differs from this. "I love it because it has style, but it is dignified and can be subtle. In contemporary architecture you can have a round glass chair hanging from the ceiling and have a laugh." Home Two, at 3905 N.E. 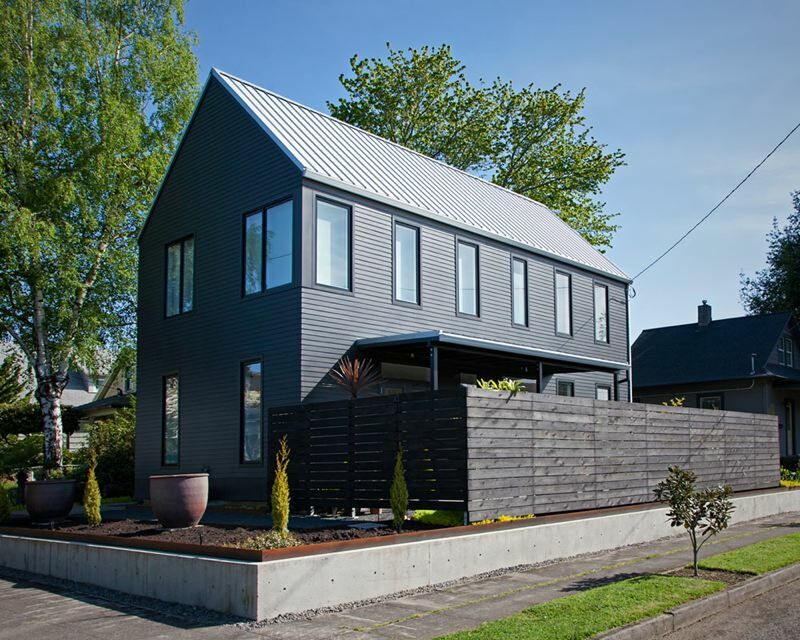 Holman St. was radically remodeled by architect Risa Boyer Leritz, who heads her own practice and has made some stunning modern homes in Portland and on her old turf, Los Angeles. 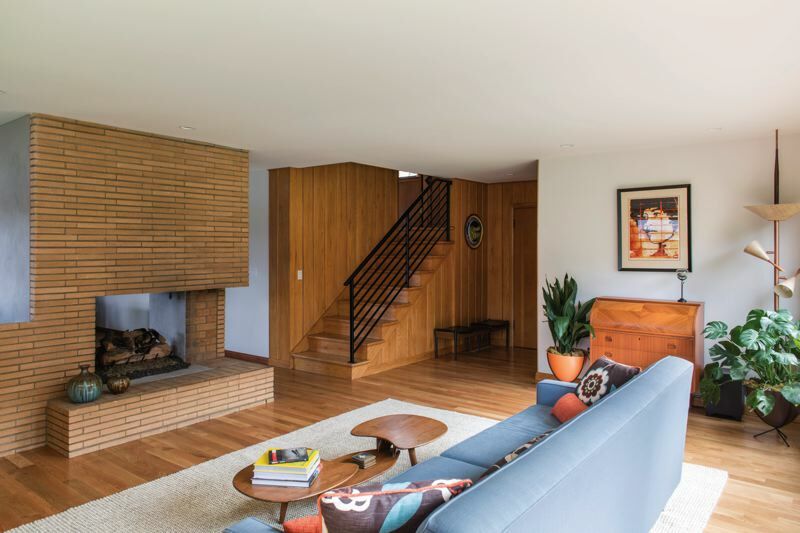 The low-lying brick and cedar home across from Fernhill Park in Northeast Portland is in a mid-century enclave. A split-level design gives it four levels. Boyer Leritz moved the disjointed kitchen and dining room to the center of the house so it joins with the living room, creating more space for the way people live now. It is occupied by a working couple where the husband can roll noiselessly out of bed on east coast time and work in his home office in the daylight basement. They rewired the whole house for the husband's work, which is the classic "something to do with IT." She added a three-feet-wide by eleven-feet-long bathroom upstairs next to the master bedroom. "The front was the living room. But you couldn't hang out and talk to anyone in the kitchen or dining room without walking down a long, dark hallway." She says that these days the people cooking are not hidden away in the kitchen any more. "You all hang out together while cooking." The only real engineering it needed was removing a supporting wall and replacing it with a large steel beam which is hidden in the ceiling. She also took a brick wall that included a fireplace and made it so the (gas) fire was visible from both sides. She knocked out a corner of that brick wall to create asymmetry, and on the other side built a cabinet from which a TV rises and can be flipped to face either room. The family had been there about five years and decided they wanted to put some money into the home and make it a place to stay. She describes the couple as "young and hip, they go to a lot of live music and have collected a lot of art," which they can now display. "To me, it's important to balance the new design so it doesn't clash. I often bring in warm wood materials." Mid-century modern is a lot easier to update than some eras. "These homes were built (in the 1950s) to be modern and clean and new and forward thinking. Now we're going in 50 years later and trying to bring it to same standard. It's not like we're taking a Victorian and trying to turn it into a modern home." These are boom times. Boyer Leritz and her husband are developing a lot along Northwest 42nd Avenue for 19 apartments in Makers' Row. They want it to be the opposite of the "soulless, purely for profit" apartment blocks going up all over the east side, "which are built poorly and are going to look bad in 10 years". 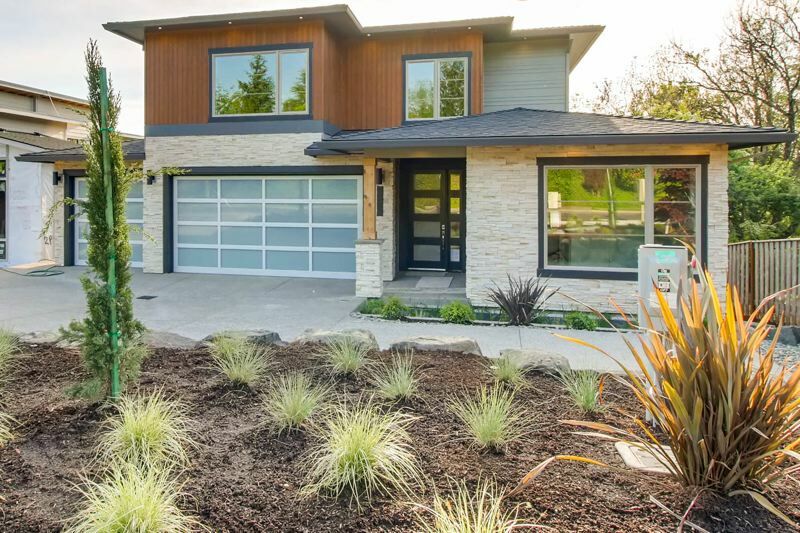 For a taste of Lake Oswego Contemporary, check out Home Six by JT Roth Construction Inc. It has suburban swagger — five bedrooms, 4.5 bathrooms, 4,100 square feet over three floors with a big deck. Kenzie Roth, who works in the family business, says the house was built from scratch over eight months and recently finished. Virgin space, it is for sale for $1.5 million. "It has a butler's pantry, a wet bar and a big wine cellar," says Roth, listing the finer points. "Because of Lake Oswego restrictions you can't just build a box. You can only have so many dimensional feet of wall before you have to put a jog in it." Mark Stewart was the architect. Roth said they left him alone, except to "move a few walls a round." JT Roth is a custom builder, doing around 30 homes per year. "The size and price tag is big for us, we're usually $400,000 to $700,000. We're noting a push for this modern contemporary style home. We are starting to build that style home, a more architectural home." They designed the interior themselves, based on what they think buyers want right now. "People like black windows and low-pitched roofs. We're getting a lot of California buyers, which is also influencing the design." Eight months was rather a long time simply because with the building boom, all the subcontractors are booked out weeks in advance, even to come in and make a small change. All the back-and-forth with the Lake Oswego design review board added to the schedule. "It's a crazy time to build right now." Home number Four is a LEED certified Passive House, which means it is insulated so well that it hardly needs a heater when human body warmth is available. The Woodlawn neighborhood home was designed by Hinge Build Group and is owned and inhabited by Claire Paris, a realtor. (It is not for sale.) Paris wanted a sustainable statement house, one which showed that energy efficiency is a moral duty but can be comfortable too. Paris says the previous owner, architect Scott Kosmecki, remodeled it extensively from a modest 1940s bungalow to a 2,100 square feet house on two levels. Scott built the house as an experiment, to teach himself about passive houses and see how well he could engineer a home that was beautifully designed." Paris says. "I paid $735,000 for it." Her electricity bill is around $10 a month. Ten dollars. To get subsidized solar installation she'd need a bigger electricity bill, so she and her boyfriend are saving up the $17,000 to buy the panels. "The thing that sold me is it's so freaking quiet! So peacefully quiet. You don't hear anything from outside. And without forced air system it's crazy how quiet it is." According to the City of Portland, the house must have a heat source, so they put in a heat pump. "We turned it on when it snowed, that was it." Paris used to live in Scottsdale, Arizona, where she got interested in energy efficiency. "I wanted a house to make the minimum impact. I liked this because it was comfortable, fun and cool, and cutting edge efficient. Now I want people to see it. You get inside a Prius and it's weird and small. I love that something can be lovely and feels good and can be energy efficient." Libby says the tour is especially interesting at times like 2017 when the real estate market is booming. "This is when things can get built. It's helpful to see what's out there and connect the dots ideas of interior style. It's like fashion: What are the designs that moved people this year?" The MA+DS Home Tours are organized by the Modern Architecture + Design Society. Based in Austin and New York City, MA + DS searches the country for architecturally interesting modern homes, using local curators. In the case of Portland, the list was compiled by Brian Libby, the architecture critic and columnist for the Business Tribune. MA+DS Modern Home Tours have visited more than 25 cities coast to coast. Austin, Texas is the biggest of the tours, with around 15 homes. Portland, however, also has a strong showing, with home owners, architects and builders wanting to get on the list. Realtors are always keen, but the fact that they are all about selling is taken into account. The self-guided tours offer a look at architecture and a chance to learn from the creative minds who designed them. Ticket holders receive a map and proceed at their own pace. Guests should be respectful. "We have a no photography rule," says Shallcross. "For a privately owned place, just ask the homeowner first if you want to take a picture of something." Tickets: $35 in advance online, $40 on the day of the tour. Children under 12 free. Portion of sales got to the Architecture Foundation of Oregon.